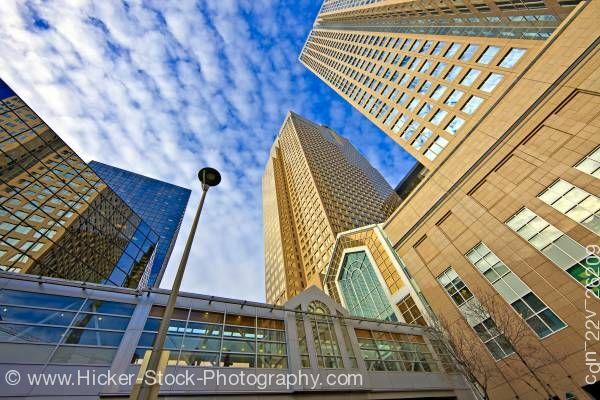 This stock photo includes the Twin Towers of the Bankers Hall and a bridge which is part of the Plus 15 Walkway system connecting high-rise buildings and shopping centres in the city of Calgary, Alberta, Canada. The twin towers stand 197 meters high with 52 floors. Both Bankers Hall East and West boast of podiums with a retail gallery leading to other buildings through the use of the Plus 15 skywalk. The skywalk network connects Banker Halls to Hollingsworth Building which holds a very important role in Calgary’s history. The Plus 15 or +15 Skyway network in Calgary, Alberta, Canada, is the world's most extensive pedestrian skywalk system with a total length of 16 kilometers (10 mi) and 59 bridges. The system is so named because the skywalks are approximately 4.5 metres (15 ft) above street level. Some Plus 15 skywalks are dual-level, with higher levels being referred to as +30's and +45's. The system was conceived and designed by architect Harold Hanen, who worked for the Calgary Planning Department from 1966 to 1969. This development earned him the 1970 Vincent Massey Award for Merit in Urban Planning. Opening in 1970, the +15 network has expanded to include 59 enclosed bridges connecting dozens of downtown Calgary buildings. The central core of the system is a series of enclosed shopping centres, and the city's flagship department stores. Calgary was founded by the Northwest Mounted Police in 1876 and was originally called Fort Briseboise and later changed to Fort Calgary. In 1894, it was renamed the City of Calgary.